Organized during October 1971, the Golden Agers provide a social afternoon for men and women fifty years of age and over. During the formative years, Vickie and Steve Waszak along with Hattie Trenkler, served as both officers and trip coordinators. Regularly scheduled activities of this organization included monthly day trips and extended five-day trips to resorts or sight-seeing tours, an annual Communion Breakfast, parties and celebrations for various holidays, and visiting and caring for sick members. In addition, the Golden Agers offer monetary contributions to St. Adalbert. Every Tuesday afternoon, approximately 35 active members meet in the lower cafeteria. 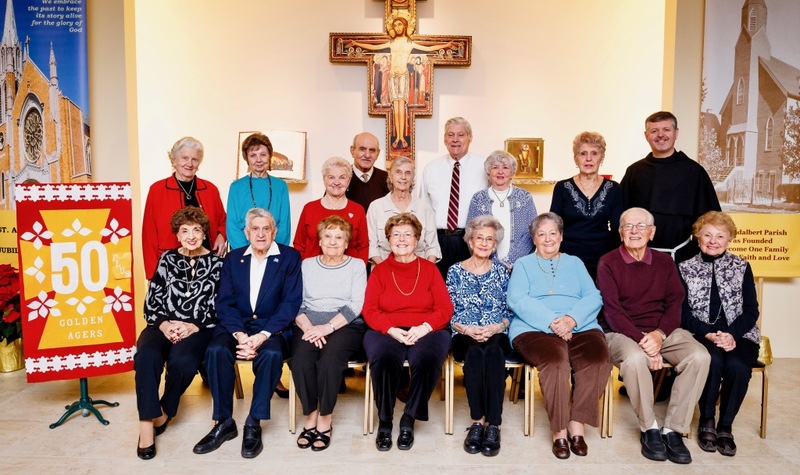 Many of these individuals have been active and supportive members of St. Adalbert for many years. The current officers are: John Bartalini, President; Rosemary Waloski; Vice President, Maureen Bartalini; Recording Secretary; Peggy Matulis, Financial Secretary; and Frank Genco, Treasurer. The members of the Golden Agers continue to be active and supportive of the St. Adalbert Parish Family and faithfully meet each week to share each others’ company.